“It means thanks, it means admiration, it means good-bye to someone you love.” Katniss explains the meaning of the three finger salute early in The Hunger Games. But the meaning of the gesture transforms over the course of the books to also become a symbol of the revolution, like the mockingjay. And so in the latest iteration of subtle in-universe marketing for the franchise, we have billboards of people giving this salute around the world. 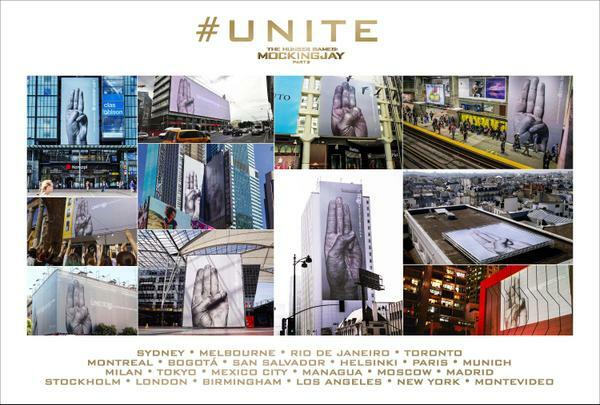 Only the hand is visible, with a simple “Unite D13 – The Revolution is About All of Us” message. If you’re a fan of the series, it has instant resonance, and in some countries, like Thailand, the salute has been used in real-world protests. We wonder what the average person thinks of the billboards – whether it’s enough to make a connection with them to these movies, whether they think it’s a REAL political advertisement, or whether they see it and see some other kind of innuendo, but it does “make an impression” so Haymitch would approve. At first we wondered if these hands were of the cast, as some kind of tease for character posters to come. Alas, no, these are ordinary people like you and me to tie better into the theme, so no clues of this kind. It’s pretty apparent from the theme and look of the posters, and the emails sent last night, that these are tied to the launch of Revolution.pn. So WHAT’S GOING TO HAPPEN AT REVOLUTION.PN? What mysteries do you hold behind that landing page? We hope there’s still some character posters or other movie-specific collateral hidden back there, even if their hands aren’t on the billboards. If the past movie campaigns are any guide, there will probably be some kind of puzzle to solve before we get to the goodies. In the meantime, we’re all supposed to flood the internet with images of our own three finger salutes tagged with #Unite. Go forth and put those fingers everywhere.